This week, we wanted to bring back one of our posts that looked at the changes of a given location over 70 years. You might remember this one, which was first published in September 2016. Located on the coast of a natural harbor on the eastern coast of New Britain, an island in the Southwest Pacific, Rabaul was a German colony in the 1900s that was captured by the Australians in World War I. Two nearby volcanoes, Vulcan and Tavurvur, erupted violently in 1937, destroying most of the city. After World War II started, it was captured by the Japanese in January 1942, after which it was transformed into a major stronghold with approximately 97,000 troops that would easily fend off Allied attacks until October and November 1943. While the Allies continued to advance towards Japan, they cut off Japanese supply routes to Rabaul and continued to bomb the city and surrounding area. It was officially surrendered at the end of the war. After the war was over, the city became a trading hub until Tavurvur erupted in 1994, once again destroying a large part of the city. Developments closest to the volcano were never rebuilt. Click to enlarge. In the photo on the left, taken from Ken’s Men Against the Empire, Vol. I, is Rabaul and Simpson Harbor as they appeared in September 1943. At right is Rabaul today, taken from Google Maps. Established in 1917 near Hampton, Virginia, Langley Field (named after American aviation pioneer Samuel Pierpoint Langley) remains one of the oldest air bases in continuous operation in the U.S. Its small airfield was expanded in the 1930s and continued to develop as World War II began. 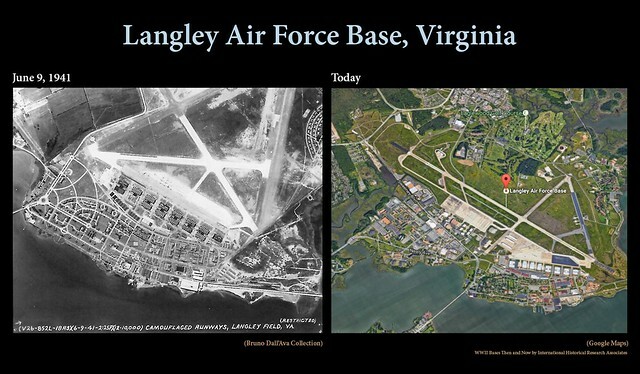 At the time the left image was taken, Langley was used as a training ground for new units, such as the 43rd Bomb Group, established in the U.S. military build-up before they entered the war. Click to enlarge. In the photo on the left, taken from Ken’s Men Against the Empire, Vol. I, is Langley Field in 1941. At right is Langley today, taken from Google Maps. 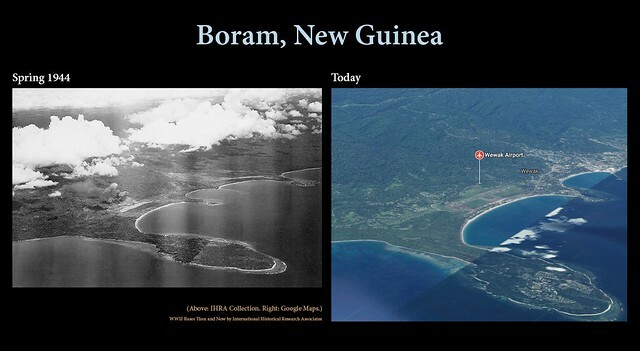 On the northern coast of Papua New Guinea, Boram (referred to as East Wewak by the Japanese) was one of the four airdromes that made up the Wewak Complex built by the Japanese during World War II. The other three in the complex were Wewak, Dagua, and But. It was repeatedly attacked by the Allies between 1942 and 1945, and finally ended with the Australians securing Boram on May 22, 1945. These days Boram is the home of the Wewak Airport, also sometimes known as Boram Airport. Click to enlarge. In the photo on the left, taken from Rampage of the Roarin’ 20’s, is Boram Airdrome after it was attacked by the 312th Bomb Group during the spring of 1944. At right is Boram today, taken from Google Maps. Approximately two years after the Japanese invaded Morotai Island, off Halmahera Island in east Indonesia, the 31st Infantry Division of the U.S. Army landed on Morotai on September 15, 1944. 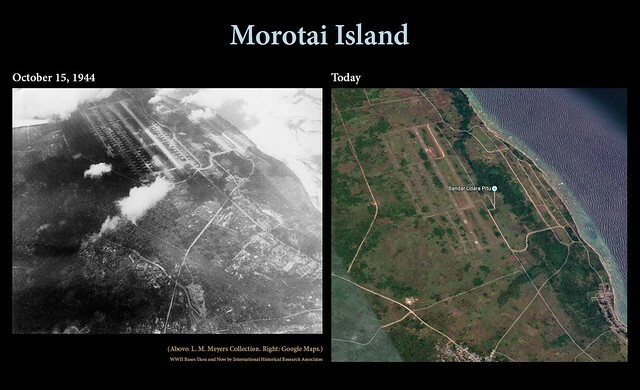 Two airstrips were built and Morotai grew into a major staging base for attacks on Japanese territory in the Philippine Islands. Almost a year later on September 9, 1945, the island became the site of the formal surrender of the 126,000 Japanese still in the Netherlands East Indies [now Indonesia]. The base became a large aircraft and vehicle graveyard after the war was over. Scrapping and smelting lasted until 1988. Click to enlarge. 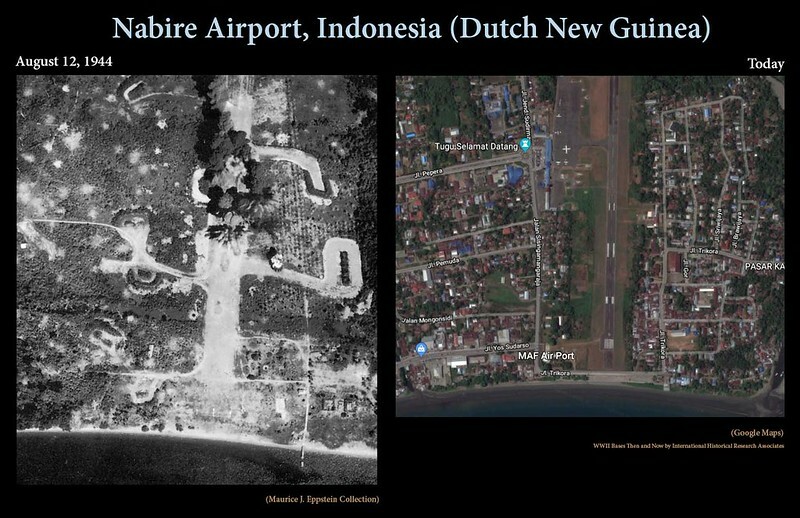 In the photo on the left, are the two airstrips at Morotai on October 15, 1944. At right is Morotai today, taken from Google Maps. 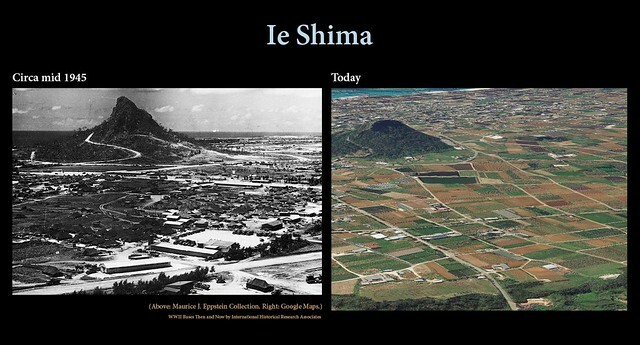 Ie Shima was part of the Ryukyu Island chain, a trail of islands southwest of Japan. It was just west of Okinawa, and was captured by the Allies as part of the Battle of Okinawa. Before American units took over the base, the Japanese destroyed the runways and buried mines throughout the island to deter Allied attacks. Once it was under U.S. control, various engineer aviation battalions were hard at work to make the island habitable for units that were due to move to the island in June. In August, Ie Shima was a stop for the Japanese surrender delegation on their way to Manila. These days, the U.S. Marine Corps operates a military training facility on part of the island, while civilians reside on the rest of it. Click to enlarge. In the photo on the left, taken from Warpath Across the Pacific, is the 345th Bomb Group’s camp area at Ie Shima in the summer of 1945. At right is Ie Shima today, taken from Google Maps. Buka Island is part of the Solomon Island chain in the southwest Pacific, on the opposite end of the chain from Guadalcanal. After being claimed by the Germans in 1885, Buka was turned over to Australia in 1920. The Japanese seized Buka on March 9, 1942 and built an air base that grabbed Allied attention in June 1943 when preparations for Operation Cartwheel were in the works. A small canal separated Buka from the island of Bougainville, which was to be the site of a major invasion, and up-to-date reconnaissance of the two islands was required beforehand. 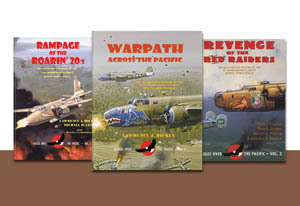 That reconnaissance mission turned into one of the most dramatic moments of the Pacific war when Capt. 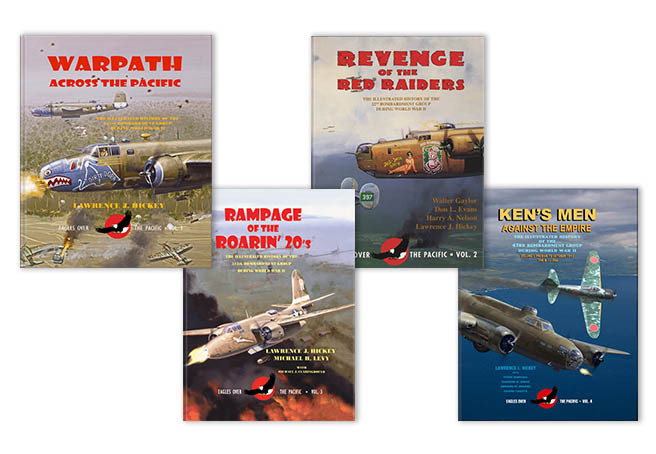 Jay Zeamer, Jr. and his crew were attacked during their photomapping mission on June 16, 1943. In the end, Zeamer and his bombardier, 2/Lt. Joseph R. Sarnoski, were awarded the Medal of Honor (Sarnoski’s was posthumously awarded) and the rest of the crew was awarded the Distinguished Service Cross for getting those photos while under fire. Contrary to internet lore, this photo was not taken during that mission. 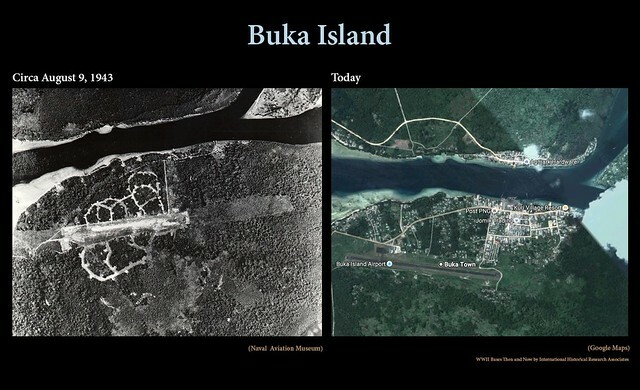 Buka remained under Japanese control until September 1945. It later gained independence from Papua New Guinea in 2005. Click to enlarge. 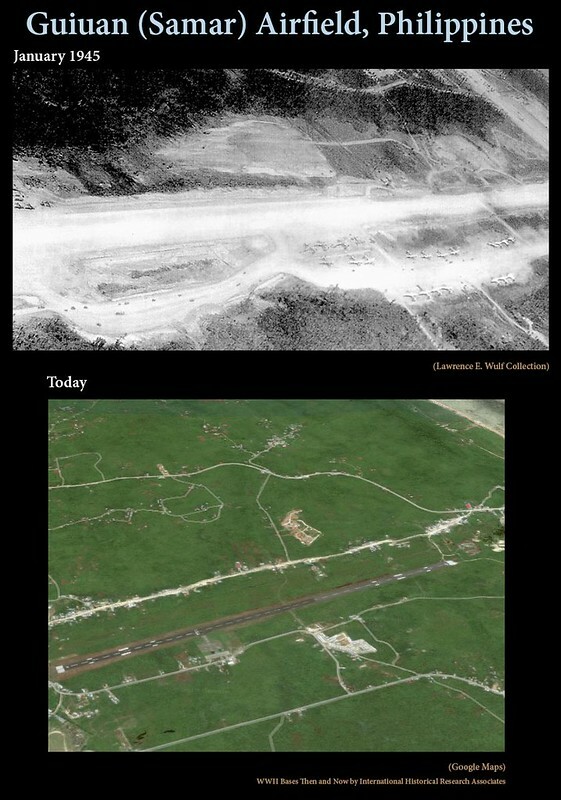 In the photo on the left, taken from the Naval Aviation Museum, the Buka airfield in August 1943. At right is Buka today, taken from Google Maps. We’re back with more comparisons of bases then and now. It’s fascinating seeing what has changed in a particular area affected by World War II. For those of you who haven’t seen the previous installments of this series, read here and here. Today, let’s take a look at a few of the lesser known bases in the Pacific Theater. Built by the Japanese during World War II, Kaoe consisted of two runways, Kaoe I and Kaoe II. Today, Kaoe II is still in use as an airstrip. This airfield was used by the Japanese during the war. It has since been converted into a road with houses lining the former runway. A crushed coral runway constructed by the Seabees, this airfield was used heavily by U.S. fighters and bombers. Today, the coral has been replaced by asphalt and the runway is occasionally used. Also built by the Japanese during World War II when Nabire was part of Dutch New Guinea, this runway is still being used today. Due to the conditions of the land, the runway can’t be extended and there is a bigger airport under construction nearby. This airfield was built by prisoners of war from the Haroekoe and Tantoei POW Camps. After the war, it was abandoned, leaving hardly any trace of its existence today. Located in Townsville, Australia, Garbutt Field was built prior to World War II and owned by the Townsville city council. It became a major airfield during the war that was used by the RAAF, U.S. and Dutch. Now known as Townsville Airport, it is used for civilian flights as well as an RAAF base. We’re working on another batch of then and now photos for you next week. To hold you over, head back to our previous post on the same topic. We’ll get you started with a U.S. base featured in that post. Located in Savannah, Georgia, Hunter Field was originally a municipal airport built in 1929. It was named Hunter Municipal Airfield in May 1940 after a World War I flying ace from Savannah, Lt. Col. Frank O’Driscoll Hunter. Soon afterwards, an Army Air Corps base was built and several units, the 3rd and 27th Bomb Groups as well as the 35th Air Base Group, would call it home for a short time. The 312th Bomb Group was another unit that did their aircraft training at Hunter Air Base (so renamed on February 19, 1941). Today, there are about 5000 soldiers at Hunter Army Airfield, including the Coast Guard’s Air Station Savannah. Click to enlarge. In the photo on the left, taken from Rampage of the Roarin’ 20’s, is the base where bomb groups such as the 312th were activated. At right is Hunter Army Airfield today, taken from Google Maps. This week, we wanted to take a look at how much several World War II bases from the Pacific Theater (as well as one from the U.S.) have changed since the war ended. What is now the Royal Australian Air Force’s largest base was under construction during most of World War II. Amberley, located southwest of Brisbane, was named by an immigrant farmer in the 1850s after his hometown in England. 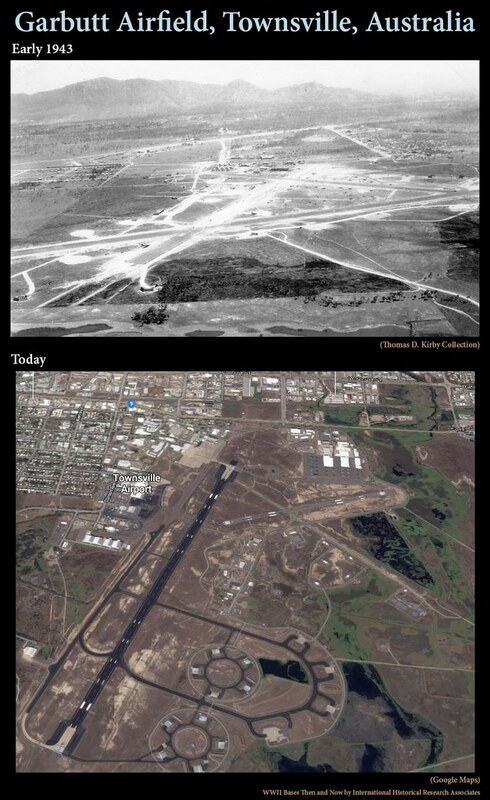 Airport construction began in 1939 and continued through 1944. During the war, the base briefly housed many Australian and U.S. units, including the 22nd and 38th Bomb Groups. Click to enlarge. At left is airfield at Amberley during the early part of WWII, taken from Revenge of the Red Raiders. The image on the right is a current view of RAAF Base Amberley, taken from Google Maps. Originally Spanish territory, the island of Corregidor was incorporated into U.S. territory after the Spanish-American War. It stayed that way until Japanese forces invaded the island in 1942, leading to the unconditional surrender of the Allies in the Philippines on May 6, 1942. Finally, in early 1945, the Allies took back the island. These days, Corregidor is part of the Philippines National Park, with several historic landmarks scattered about the island. Click to enlarge. (Left) A 43rd Bomb Group strike photo of Corregidor after it was bombed by the Group, taken from the IHRA archives. 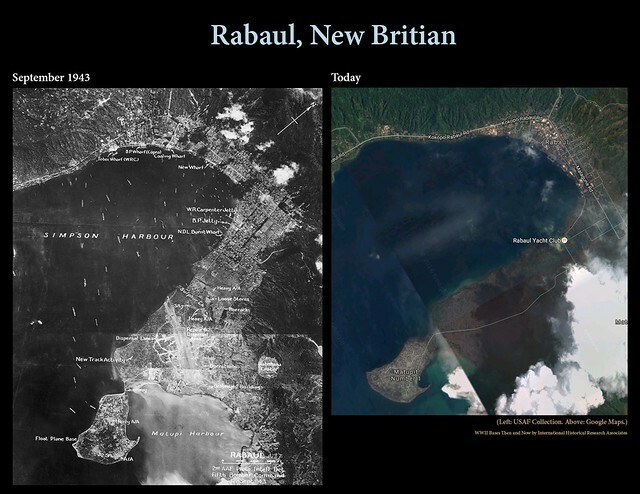 (Right) This satellite image of the island shows how it has changed since World War II. Image taken from Google Maps. Manila was also a Spanish territory that was given to the U.S. after the Spanish-American War. From 1935-1941, it was Gen. MacArthur’s base during his time as a military advisor. The city was attacked by Japanese on December 8, 1941, and, after repeated bombings, it fell into Japanese hands in January 1942. Three years later, the U.S. returned to Manila and fought a bloody month-long battle to recapture it, destroying much of the city in the process. This picture was taken at the tail end of the conflict. The city has since recovered and is now a major urban center in the Pacific, the capital of the Philippines, and has a population of over 1.5 million people. Click to enlarge. 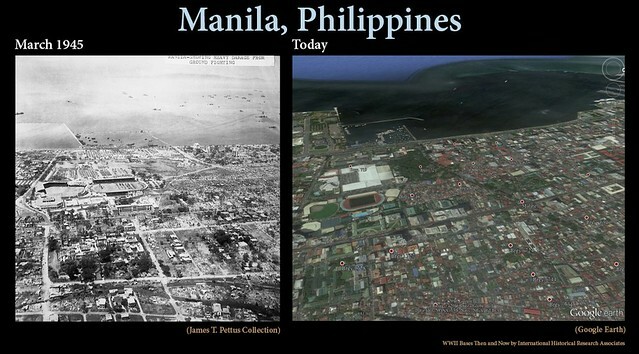 The photo on the left, taken from the IHRA archives, shows the destruction after Manila was bombed. At right is a satellite image of a rebuilt Manila taken from Google Earth. Before the Japanese set foot on Wakde Island in April 1942, it may have been inhabited by a small native population. Over the next year, much of the foliage on the island was cut down to make space for a runway that was 5400 feet long and 390 feet wide. The Japanese leveled more of the island to build 100 pillboxes, bunkers and other defenses. On May 15, 1944, the fight over Wakde began. All but four Japanese soldiers stationed there fought to the death. Wakde was further expanded by the Allies, almost completely clearing the island of vegetation in the process. Today, the island is uninhabited. Click to enlarge. 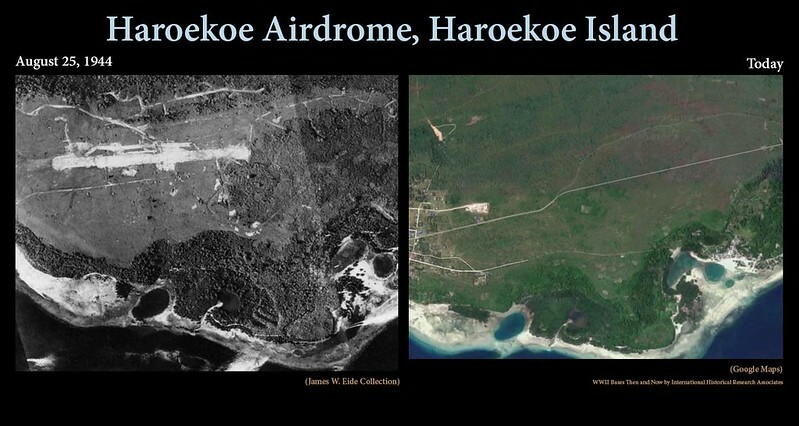 The photo on the left, from Rampage of the Roarin’ 20’s, shows Wakde Island after its development as an Allied base. The image on the right is from Google Earth. This base, located north of Lae, started out as a tiny native village that was eventually populated by German Lutherans of the Gabmatzung Mission in 1910. A small airfield was later established. The Japanese captured Nadzab in 1942 and occupied it until early September 1943 when Gen. MacArthur ordered Operation Postern to be carried out. Once Nadzab was in Allied hands, it was expanded into a huge airbase with five airstrips. As the war wound down, Nadzab was redesigned as an aircraft boneyard. Today, it serves as a small regional airport. Click to enlarge. 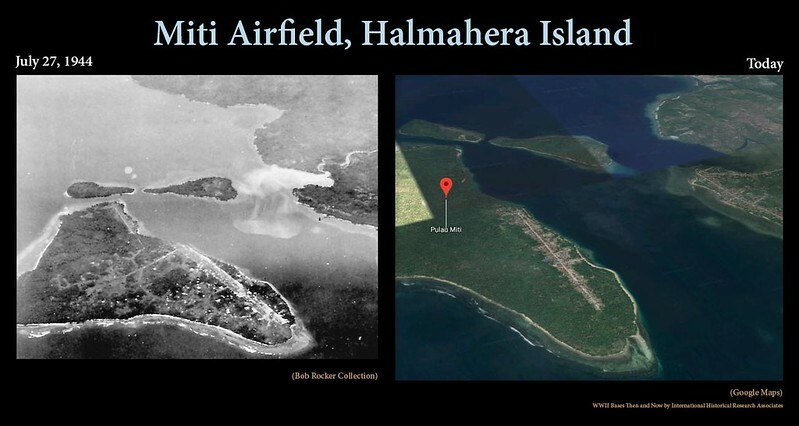 At left, four of Nadzab’s five airstrips can be seen in this photo from IHRA. Today, the only sign of this former base is the single runway seen slightly left of center. The satellite image is from Google Earth.